Vanessa Ravel is with us, today. Vanessa, can you please tell us about yourself and how many books you have written? Vanessa: I’m an epidemiologist by trade and training but a fiction writer at heart. Recently I’ve chosen to focus more on my writing, which I have unfortunately up to now neglected in favor of more traditional career choices. Truth be told, I’ve been a storyteller as long as I can remember (scientist, not so much). Before I could hold a pencil straight, I used to write and draw story “books” bound with staples and scotch tape. While I don’t write about about Disneyland and dog picnics anymore (my subject material is a bit heavier nowadays), I do still enjoy the odd trip to Disneyland as I live in Los Angeles, and dog picnics are always on the to-do list with my veritable zoo of domestic (albeit hardly domesticated!) animals. I have only written one novel but I am in the process of writing my second. Me: Wow! Sounds like you've been busy. :-) What is the name of your latest book and what inspired it? Vanessa: I wrote Four o’Clock Alice as a reaction to a personal tragedy, and that gave me the perspective to ‘write what I know,’ not in a sense of ever having been in any of the characters’ situations per se, but nonetheless being newly able to empathize with those situations. My writing tends to plumb the depths of the human condition, sometimes only scraping up black sludge but other times hooking the occasional abyss-dwelling leviathan and casting it to the surface. I make sure to leave a light on for the reader somewhere, though, because even the darkest dark fantasy fan scrambles for the night light when the nightmare is too real. Me: Sometimes banishing the nightmares to the page is the only way to get them to give us peace. What are you working on now? Vanessa: For the last few months I’ve been in short story mode, submitting to anthologies and competitions. In December, I’ll be able to focus more on fleshing out my second novel, a dark fantasy about little girl struggling to fit in at new school, in a new town and biting off more than she can chew when she decides to run away. YA it's decidedly not, but a coming of age will definitely ensue (think more Carrie than To Kill a Mockingbird). Me: Sounds interesting! What authors, or books, have influenced you? Vanessa: People are going to want to shoot me, but I’m not a big reader. There, I said it. It’s not that I’d rather watch a movie than read a book (I watch very little television), but I just was never that much into reading. When they had “turn off the TV week” at school, I turned off the TV and wrote stories. I guess I didn’t get the fact that I was supposed to read instead. I am a big Stephen King fan, however (who isn’t? ), not just for his storytelling talent, but for his unbelievable characters. King is the only author who has ever gotten me to want to read. Me: I think a lot of people feel that way about Stephen King. :-) What are you reading now? Vanessa: The Spring 2012, Issue 82 Glimmer Train literary journal. A bit outside my preferred genre, but I’m learning to try new things. Me: It's always good to expand our horizons. ;-) For those who might consider reading your book, what would you tell them to expect? Vanessa: It’s a unique story that’s quite dark at times and takes some pretty unexpected turns. Me: Cool! What is your favorite part of being an author? Vanessa: Working at home! ;-) I love that I get to put my soul on paper. As scary as that is, baring everything to everyone, it’s cathartic, too. It’s the best therapy. Me: I agree, writing can often be the very best therapy. Do you have a day job as well? Vanessa: I’m currently a medical writer/epidemiologist and that takes quite a bit of time from my creative goals. Such is life! Me: Ah, well, earning a living is important, too. ;-) What are the hardest and easiest parts about being a writer? Vanessa: We don’t write because we enjoy the crushing self-doubt (well, some of use might). And I don’t believe it gets much easier. I haven’t met any writers that are not at least somewhat introverted, so I think that self-deprecation is an occupational hazard. So for me, the easiest part is the ability to come up with the story. The hardest part is convincing myself it’s good enough for anyone’s eyes but my own. Me: Yeah, I think most writers get attacks of perfectionism that need to be overcome before we can share our "babies." What genre do you place your book in? 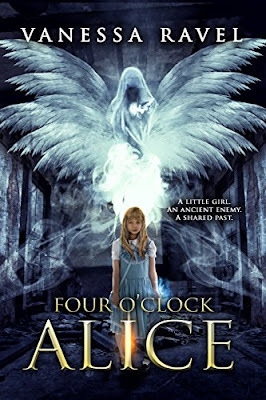 Vanessa: Four o’Clock Alice is a gothic dark fantasy. Vanessa: I may be an introvert, but I love to keep in touch with my readers! If you’ve read my book, let me know if you liked it so I can write another one you’ll like too! Me: Amen! And so these fine folks can find you, are there any links you'd like me to post?